Ida (Denyer) Green wrote the poem Mother, about Zerelda Ann (Singleton) Denyer. Ida's father was the brother of my second great grandfather, Ebenezer Denyer. Ida spent some time living with her Uncle Ebenezer and Aunt Sarah (Hartley) Denyer after both her parents had died. My maternal grandmother's sister, Willa Van Every, also wrote a poem called Mother, about my great grandmother, Margaret (Denyer) Van Every, and Willa also mentions several of her siblings. 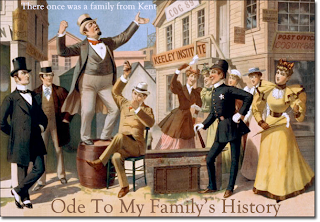 I wrote Where I'm From - based on George Ella Lyon's Copy-Change template of the same name. And a few fun limericks, though none of them are specifically about my family history. As soon as I heard the carnival theme, I knew I had to participate, even though any family history collections are likely a few years away from being written. I still have a lot of research to do. While I composed two odes, I am only going to share one of them. The other I am going to put aside for reasons of my own. as the nation moved towards war. she raised on her garden. John, I read and re-read this delightful poem. Very, very nice. Very nice poem! I did not think about focusing on one person, but how nice it is when you do that. I love the 'tree the rabbits' part.